Universal Orlando’s new retro-themed Cabana Bay resort complex is the largest hotel construction project in the U.S. this year, and it’s gone modern with audio systems comprised of Tannoy, Lab.gruppen, and Biamp. This summer, Universal Orlando opened a new resort, the fourth to be built onsite at its popular Florida theme park, with a distinctly retro look and feel, right down to the sign out front advertising “Color TV,” Pabst Blue Ribbon in the bar, and Alberto VO5 shampoo in every room. But while the Cabana Bay Resort nails the details of family beach vacations of the 1950s and ‘60s, the installed AV technology is most certainly 21st Century. The new destination, a partnership between Loews Hotels and Universal Orlando Resort, is “a throwback to when you loaded your family in the station wagon and you drove down to Florida,” states Russ Dagon, vice president and executive project director for Universal Creative in a video feature posted online. The 1,800- room resort, comprising 900 guest rooms and 900 family suites, is reportedly the largest hotel construction project of 2013-14 in the United States. 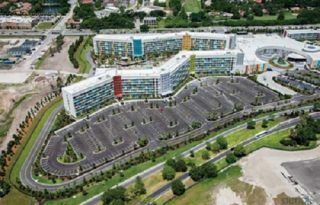 Located on a 37-acre site adjacent to Universal’s Islands of Adventure theme park, the resort comprises a horseshoe-shaped two-story main check-in and guest amenities building flanked by two courtyards. The Cabana Courtyard, completed in late March in phase one, features three four-story hotels—Starlight, Thunderbird, and Castaway—encircling a 10,000-square-foot, zero-entry pool, a sand beach, and a 4,000-square-foot dive tower water feature with a 100-foot waterslide. The final phase, Lazy River Courtyard, opened June 20. It features a 6,000-square-foot, zero-entry pool, another sand beach, and Universal’s first lazy river attraction, complete with waterfalls, water cannons, and water spouts, flanked by two four-story hotel buildings, The Continental and The Americana. The loudspeakers and amplifiers installed at the resort are almost exclusively Tannoy and Lab.gruppen, according to Jay Lock, VP and general manager of SmartWatch Security & Sound, based in Orlando, which provided integration of the sound, security, and fire alarm systems at Cabana Bay Resort. The equipment was specified by commercial technology consultants Network Technologies, Inc. (NTI) in Atlanta, GA.
More than 300 Tannoy speakers are installed, including CMS and CVS model in-ceiling speakers, DVS surface-mount models, and OCV pendant speakers. “All the speakers on the property—except the in-ground speakers; they went with SoundTube for those—are Tannoy,” Lock reported. About 90 percent of those Tannoy products are in-ceiling, he added: “For the most part they are six-inch and eight-inch speakers.” Lab.gruppen C Series four- and eight-channel amplifiers drive the speakers. Multiple Biamp AudiaFLEX digital audio platforms provide system management and processing. Michael Cooley, CTS, of Mainline Marketing, the manufacturers’ rep firm for the TC Group, which includes Tannoy and Lab.gruppen, reported that all the pool areas feature DVS speakers. Tannoy’s DVS series products, rated IP64 to EN60529 (IEC529), are eminently suited for outdoor use. The amplification and DSP equipment is housed in a weatherproof utility closet in each courtyard, he added, with a Biamp RED-1 (Remote Ethernet Device) providing control of the respective AudioFLEX system. In the main building, “There are OCV pendant speakers installed in the Starbucks,” added Cooley. Tannoy speakers are also installed throughout the Bayside Diner, Swizzle Lounge, and the various family-friendly entertainment and amenities, which include Galaxy Bowl, a 10-lane bowling alley; the Game-O-Rama game room; Fun in the Sun Rec Center; and the Jack LaLanne Physical Fitness Studio. Basic switching and volume control is available at a couple of locations via Crestron wall panels, said Lock. In the Bayside Diner, where four large screens and projectors are installed, “They can swap sources from the background music playing to the screens, or switch the audio to the overhead area speakers, where they’re showing maybe ‘The Flintstones,’” he said. SmartWatch was also responsible for installation of the security equipment, which includes a camera system comprising a network of 290 Axis P33 series cameras ranging from 1MP to 5MP models. “Many outdoor cameras are on Polevators for ease of service,” said Lock.